What’s the big deal about sharing science on Instagram? A recent Science magazine editorial criticized scientists’ use of Instagram to share their research and conduct outreach, seemingly on the grounds that (especially women) scientists shouldn’t be engaging in online outreach without the formal support and acknowledgement of their academic institutions. I agree that science and academic institutions should be formally rewarding online and other science outreach. And they certainly should not be “pushing” these efforts unfairly or unequally on minority scientists. An image created by science instagrammer Nelle Couret, Ph.D., assistant professor in the Department of Biological Sciences at the University of Rhode Island, for the Scientists Who Selfie project. She studies mosquito and tick-borne diseases, as well as the #ecology, #symbiosis and evolutionary ecology of insects of public health importance. Nelle gives others permission to use this photo under a Creative Commons share-alike with attribution license, for science. But criticizing or otherwise questioning the time or efforts that individual scientists spend sharing science and expressing themselves on Instagram is evidence of a misunderstanding of why scientists do this, and how it can matter. If we can pull any lessons from the motivations of science bloggers, scientists who use social media do so overwhelmingly to practice their own communication skills, to explain and communicate science to lay audiences, to foster public interest and to connect with others. While a sense of obligation to share science, enact change in academia or advocate for a cause are reasons some scientist bloggers give for communicating online, these fall much further down the list of motivations, while popularizing science and self-expression motivations dominate. Especially in the typical absence of formal academic reward systems for online outreach (nobody is getting tenure yet for their science blogging or Instagramming), I think it’s incredibly important to understand science bloggers’ and Instagrammers’ motivations. Why? Because how can we criticize science Instagrammers for somehow “failing” to change gender disparities with their posts and communication efforts, if this goal isn’t even among their more important reasons for using IG?? 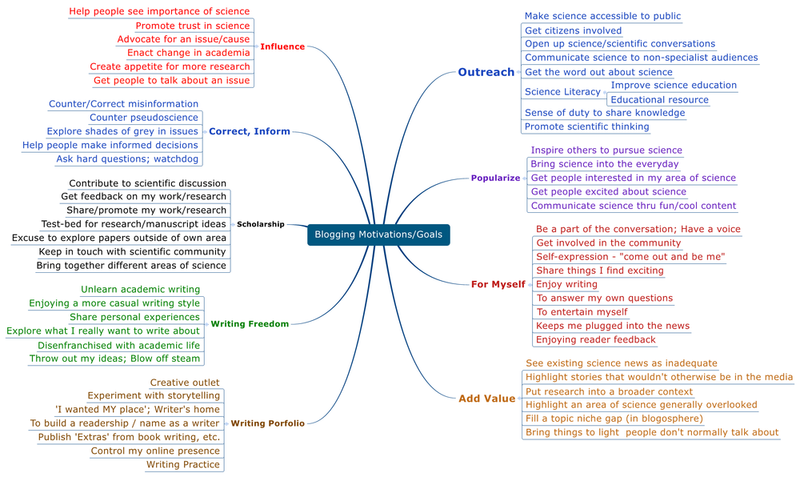 Jarreau, Paige B (2015): #MySciBlog Interviewee Motivations to Blog about Science. figshare. But while we are on the subject… scientists’ Instagram posts, especially ones in which they share photos of themselves in science settings (yes, selfies), might indeed be able to positively change gender science stereotypes, or stereotypes that associate STEM activities and abilities with being male and vice versa. This is based both on preliminary data that the Scientists Who Selfie research team is collecting and analyzing as I write this post, but also on evidence that the increasing representation of women scientists in magazines, on TV, and in social media may be changing stereotypes. In the case of Instagram posts, this change can happen regardless of scientists’ motivations for creating IG content. In other words, positive changes in public perceptions and gender stereotypes might be an added benefit of many and diverse scientists sharing their experiences and photos online. "We are studying how newly formed species interact when their range overlap after long periods of evolution in isolation, and how the climate affects these interactions. To achieve that, we monitor hundreds of nest boxes in the woods of the island of Öland, Sweden, where two species of flycatchers (Collared flycatcher Ficedula albicollis and Pied flycatcher F. hypoleuca) compete to breed in. Sometimes, finding the right nest box is a challenge! This one was tricky to find, but very rewarding: a couple of breeding Pied flycatchers!" - Dr. Fernando Mateos-González. Post and photo created for the Scientists Who Selfie research project. But let’s get back to those personal motivations. After the Science editorial came out, my friend and research colleague Samantha Yammine and others encouraged scientists on Instagram to share their motivations, using a hashtag (#ScientistsWhoSelfie) that we co-developed for a research study on perceptions of scientists on IG. The hashtag, which has already been far more popular that I ever thought it would be when I first started the campaign for our Experiment.com project, took off like wildfire again this month. Hundreds of scientists, male and female alike, used the hashtag as well as #StrongerTogether to share why and how they use IG as scientists. Why do scientists use Instagram? Let’s hear from this month’s #scientistswhoselfie posts. You might be starting to get a picture of why scientists Instagram, or why they communicate science online more broadly. While many of us do think about how our activities might enhance the representation of scientists, or women scientists, or Hispanic scientists, etc., this likely isn’t the driving force that keeps us coming back to IG every day to share our lives in the lab or field. What drives us are motivations to engage the public, make research more accessible, build a community around ourselves, practice our communication skills, send photos to our friends and family, show how scientific knowledge is actually created, and express our passions creatively. If we change public perceptions or stereotypes about who is or can be a scientist, by being ourselves online, that’s bonus. Some scientists may start online communities and hashtags deliberately to bring minority scientists together and amplify their messages, but this tends to come after an initial effort purely focused on knowledge sharing and self-expression. "I love how connected we can get to people even if they are thousands of kilometers away." It’s ridiculous to conjecture that most women scientists are putting on lipstick and posing in the lab with the deliberate goal of challenging gender science stereotypes, and then using precious minutes they’d rather be spending on research posting updates to Instagram with the primary goal of addressing gender disparities in academia. That’s ignoring all the evidence we have about scientists’ primary motivations to use social media. Weekend Science Vibes. Via Instagram. I believe that if we are going to judge or measure the impact of scientists’ Instagram use at all, we should do so in accordance with their motivations to communicate science via this channel. For example, many say they are using Instagram to show people what scientists actually do every day, to share knowledge and to share the excitement of research. So let’s measure whether science Instagram posts are actually reaching lay audiences, helping them learn about science, and promoting positive perceptions or trust in science and scientists as communicators. Let’s NOT criticize the efforts of individual female scientists on IG for failing to fix issues of discrimination and exclusion in science. Most #scientistswhoselfie aren't claiming to be trying to address these issues directly via their Instagram posts. And that’s good, because the onus for fixing these issues should definitely not fall on the shoulders of the people who are the target of such discrimination and exclusion. These issues should be addressed at multiple levels, including the institutional level. But if individual scientists doing what they love and advancing their own spheres of influence, impact and support on Instagram are even to the tiniest extent create greater public exposure to minority scientists and changing stereotypes via social media (which I believe they are, based on data), I think some freaking celebration is deserved.